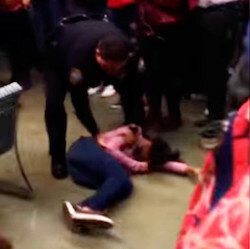 Jasmine Darwin is the name of the 15 year-old-young Black girl who was shown being body slammed on camera by Police Officer Ruben De Los Santos at Rolesville High School in Rolesville, North Carolina. The video shows footage of a crowd of students standing around then the officer picks the girl up over his head and slams her to the ground. He then picked her limp body up, put her in a handcuff position and nearly drug her away. The presence of law enforcement in schools is a reminder for students that they are worthy of being constantly patrolled and criminalized. Instead of school staff working with young people to address behavioral issues, police criminalize and abuse them. Mirroring officers in Black communities, school police target, harass, and use excessive force on Black children --doing everything but being a resource of safety. Black children are not target practice for the police. There should be no tolerance for the physical, verbal, mental and emotional abuse done to our children in school. Officer De Los Santos was placed on administrative leave but is still being paid. Meanwhile, Jasmine now has a concussion, was forced to transfer schools and now has to live with this experience for the rest of her life. Terminating Officer De Los Santos’ employment is the first step toward obtaining justice for Jasmine and protecting other students from police violence. Here's the letter we will deliver to the Rolesville Police Department on your behalf. The video of Officer Ruben De Los Santos, who’s an employee of the district, is extremely disturbing. His use of excessive force on 15 year old Jasmine Darwin, who now has a concussion, is inexcusable. Officer De Los Santos was hired to protect the students and throwing a child's body to the ground proves that he is not fit to fulfill his position as Resource Officer. Do what’s right for your students and terminate officer Ruben De Los Santos as an employee.